It isn’t all about the Master Chief and Gordon Freeman, you know. Sometimes we have to give some love out to the NPCs and supporting characters too – which is exactly what we’ve tried to do here. Below, we offer up the list of our top ten supporting characters from computer games. The only rules we imposed on ourselves are that entrants cannot be the main playable character of a game and that each franchise can only feature once. Other than it’s a level playing field – villains and heroes are both welcome! That said, there are doubtlessly going to be a few iconic characters we miss or can’t squeeze in. One that springs to mind in Glottis from Grim Fandango, who we just couldn’t fit into the list without expanding the roster. If you’ve got ideas of your own as to who should be on this list and what order they should be in then we’d love to hear them – so take a look below and let us know your thoughts in the forums. Andrew Ryan is likely to be an unpopular choice for many due to his hasty and rather sudden departure from the storyline early on in the game and that fact that he doesn’t feature as prominently as he perhaps should – but honestly, that’s part of why we like him. Ryan may not be the most likeable character in the game and it’s a shame that most players never really sit down and think about whether he really is a villain or just a man who got obsessed with a dream, but Ryan is certainly the most important character in BioShock. It was Ryan who built the underwater city of Rapture. It was Ryan who pulled the population together to share his vision of a completely free capitalist economy. It was Ryan who sought to create a world where man could take pride in their work and be able to earn a living from their pride. And it was Ryan who was, in the end, so committed to this vision that he let Rapture be destroyed by it. Ryan’s most important quality though is the consistency with which he is presented – a stern, confident tyrant who considers himself little more than a servant. Everything Ryan does is in keeping with his philosophy and the strength of his conviction alone, which is admirable enough to warrant his place on this list. Defining Moment: Meeting Ryan face to face is a dramatic moment in the game. We daren’t spoil it for those who haven’t played the game, but it really highlights the lengths that Ryan will go to in order to turn you to his way of thinking. Don’t Mention: Fontaine Futuristics, Ryan’s main business rival. Oh, and Communism. Both Baldur’s Gate games are absolutely massive in terms of playtime and we’ve doubtlessly invested hundreds, possibly thousands, of hours in each game. When the games are that big and there are hundred of well-written characters all jostling and competing for screenspace, then it takes a very big personality to stand out. Cue Minsc, the barbarian/ranger who loyally falls in line behind you as a mentally impaired and incredibly dumb powerhouse. There are few characters in the game who can rival Minsc in direct battle, but it isn’t his strength and usefulness which endeared him to RPG fans – it’s his blind and total commitment to the battle against evil. Still, that said, the number one reason that most players seem to keep hold of Minsc instead of swapping him out for a more predictable follower is his ever-present companion, Boo. 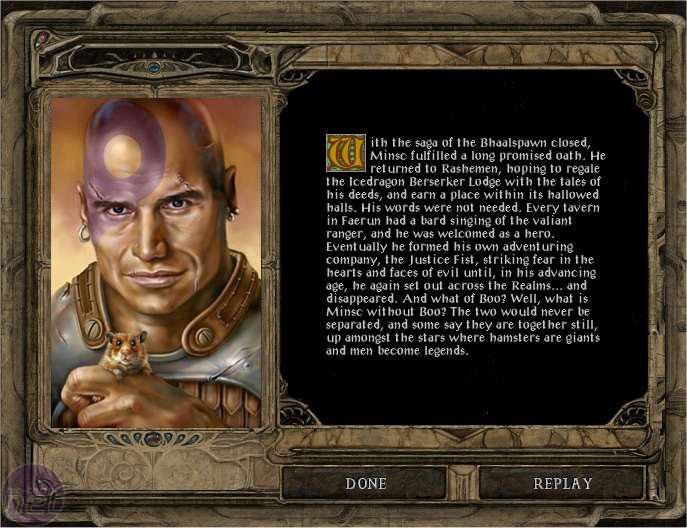 Although it’s never directly cleared up whether Boo is just a regular hamster who happens to be owned by a mentally unstable warlord or if he is indeed a Miniature Giant Space Hamster, it’s clear the Boo and Minsc are joined at the…hip? The pair can never be separated even by the player and the bizarre relationship they share makes them instantly memorable. Don’t Mention: Cavity searches. There’s literally no way to separate Minsc and Boo, though thankfully you won’t hear the gory details unless you explore the fanfic.